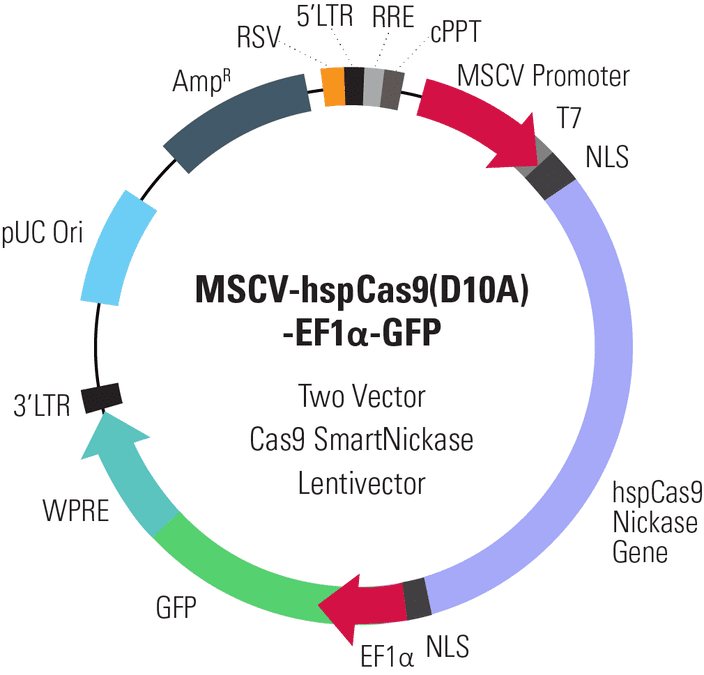 When you’re working with difficult-to-transfect-cells and want to reduce off-target events, use our lentiviral Cas9 Nickase-MSCV-hspCas9(D10A)-EF1α-GFP . When you’re genome editing in a transfection-resistant cell line and need to keep off-target events to a minimum, turn to one of SBI’s Cas9 SmartNickase™ Lentivector Systems. Unlike the wildtype Cas9 protein which introduces double-strand breaks (DSBs), the MSCV-hspCas9(D10A)-EF1α-GFP Two Vector Cas9 SmartNickase introduces paired nicks at the gRNA-directed site. Creating nicks favors the higher-fidelity homologous recombination process over non-homologous end joining (NHEJ), with paired nicking shown to reduce off-target activity by 50- to 1,500-fold in cell lines, and to facilitate gene knockout in mice without losing on-target cleavage efficiency1. Available as lentivector plasmids, ready-to-transduce pre-packaged pseudovirus, and in a package-your-own-lentivector kit with the lentivector plasmid and the LentiStarter 3.0 Packaging Kit, the MSCV-hspCas9(D10A)-EF1α-GFP Two Vector Cas9 SmartNickase Lentivector expresses human codon-optimized Cas9 nickase (the D10A mutant) from the strong MSCV promoter. The vector also includes a GFP marker expressed from the EF1α promoter to verify transduction efficiencies. All pseudoviral particle preparations have been packaged to exacting QC standards and come with functional titer and in-house transduction data for each production lot of virus.